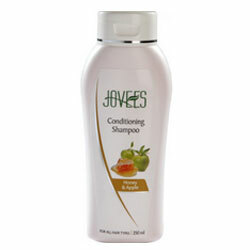 Jovees Herbal Conditioning Shampoo developed scientifically helps to preserve the integrity of the herbs thus giving optimum results. A herbal preparation containing Aloe Vera, Honey, Apple & other powerful herbs that help to strengthen hair roots, prevent hair fall while adding body, volume and luster to hair. In case of acute hair fall preferably use Jovees Amla and Bael Hair Tonic every night before going to sleep.